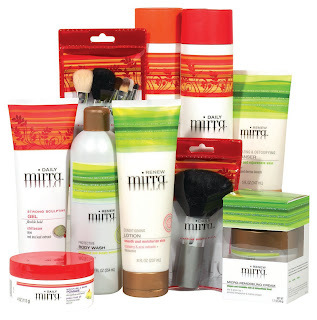 mirra is a comprehensive line of new beauty products sold exclusively at Kroger stores. The mirra collection is made with natural ingredients such as olive oil, aloe leaf juice, and cranberry, bamboo, honey and chicory root extracts and includes shampoos and conditioners; hair styling products; body washes and mists; facial and skin care lotions, cleansers and cleansing cloths; eye firming and age defying creams; and cosmetic brushes. I received a big box of mirra products to try for a few weeks, courtesy of Global Influence. I don't ordinarily like grocery store brands but I thought I'd give them a try. I wasn't expecting much, being something of a snob when it comes to skin and haircare products. 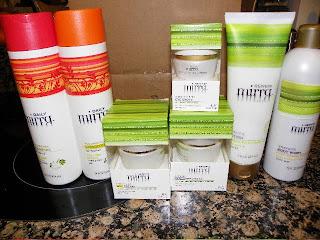 I received mirra volumizing shampoo and conditioner, eye cream, day and night facial cream, body wash and body lotion. I figured I'd use them for a week or so and go back to my old department store and salon brands. Much to my surprise, I absolutely LOVE them. The shampoo and conditioner make my normally limp and frizz-prone hair bouncy and smooth, plus it smells like a more botanically-derived version of Hawaiian Punch. (A good thing, in my book.) I don't ordinarily like shower gels but the mirra version lathers like soap and smells gorgeously of bamboo and honey. The facial care was my biggest surprise. I have oily skin in summer and dry skin in winter and usually alternate between pricey brands I have to order online. I liked the mirra creams so much that I actually went to Dillon's (my local Kroger affiliate) and bought the mirra exfoliating facial cleanser to try, as well! I have experienced no dry patchiness or oiliness with these products, which is something akin to a miracle. And the prices are affordable, too- the facial and eye creams are at the high end at about $14 each. (For a limited time, mirra is offering $5 off when you purchase any two mirra products. To download the coupon visit www.kroger.com/coupons.) I am very impressed with everything I have tried and am looking forward to purchasing the cleansing wipes next. Kroger Company for review and giveaway as a part of the Global Influence Network. To enter and win your own mirra sampler similar to the one I received (contents may vary), please comment on this post with the mirra product you would most like to try. I'd love to try the Japanese Yuzu foaming bath as I love citrus scents! I would like to try the shampoo for sure! Also, I am a blog follower. I'd like to try the exfoliating cleanser the most. I think I need to try the mirra smoothing conditioner. My hair seems to be broken everywhere anymore. I'd love to try the Bamboo & Honey body wash! Thanks! I would love to try the Japanese Yuzu body lotion. I added your blog to my favorites on Technorati (username Nelsby). I would love to try their brushes. They look so luxurious! The Bamboo and Honey Shampoo sounds nice! Well I'm certainly fascinated by your "organic hawaiian punch" decription, and I do love to rotate different shampoos and conditioners, so I'd try those! I shop at Kroger but I hadn't noticed these products before! I WOULD LOVE TO TRY THE JAPANESE YUZU BODY SPRAY MIST! Ooooh, their shampoo would be great! I especially love the fact that the ingredients "counteract the harsh effects of hard water"...that is definitely something I need! I would like to try the Japanese Yuzu body spray. I'd like to try the Bamboo and Honey Body Wash. I would love to try the Japaneze foaming bath! I am going to have to say the bamboo & honey foaming bath sounds wonderful! I would love to try the day and night facial creams. Lemongrass & Ginger Body Wash. I would love to try the mirra Daily makeup brushes!